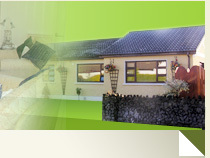 Welcome to Celtic Lodge Bed & Breakfast. 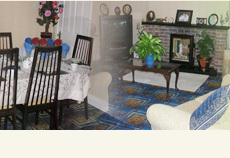 Established in 1998, we offer comfortable and relaxed accommodation close to the heart of historic town of Maynooth. With a range of ensuite rooms, Celtic Lodge Bed and Breakfast has a proud tradition of offering a high standard of service within friendly surroundings. Our guest lounge has a television, video, dvd and stereo. 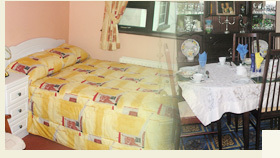 Car parking is available just beside the house and tea / coffee facilities are available in all bedrooms. Guests also have access to a secluded garden. Located just off the M4 we are within easy reach of some of Irelands most impressive golf courses including The K Club and Carton House. Maynooth Main Street, which is just a short stroll away, is home to St Patrick�s College and Fitzgerald Castle. Two of Irelands largest employers, Intel Ireland and Hewlett Packard are only a few miles away in the neighbouring village of Leixlip. In the other neighbouring village of Celbridge you can visit Castletown House, Ireland's largest example of a Palladian style county house. Celtic Lodge is suitably located close to public transport services. The 66 bus service travels to Dublin City regularly everyday. The local train station which is just a short walk also regularly travels to Dublin and also the west of Ireland. We look forward to meeting you and helping you to make your stay in Maynooth an enjoyable one. If you have any questions about the services that Celtic Lodge offers, please contact us on 01 628 6552. Copyright 2005 celticlodgebandb.com. All Rights Reserved.